Home»Blog»Make BackWPup»New Release: We just released BackWPup 3.4.2! 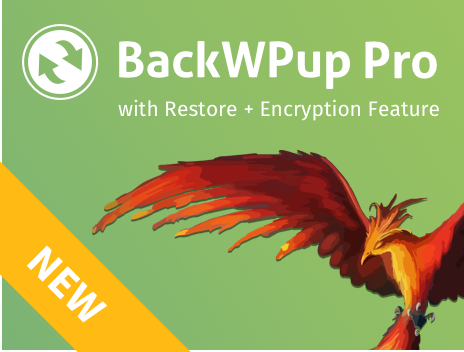 New Release: We just released BackWPup 3.4.2! We released BackWPup 3.4.2! In this version you find mainly bugfixes and we improved the Chinese translation and other improvements. As usual, you can download the free version from WordPress. And you can download the pro version from backwpup.com. When you already installed BackWPup, you can easily update your plugin via your WordPress dashboard. A couple of days ago, Larry W. Cashdollar and the WordPress Plugin Directory informed us about a potential security issue in BackWPup. To solve this security issue has been the most important thing in this release. The problem had been that, under certain server settings, directories of the WordPress installation could have been listed. As the directory in which we stored the backups and the backup files being in there had similar names, data names could be guessed easier. In consequence of that, they could have been downloaded from others once having guessed the data names. We think that this danger existed only for a few BackWPup users as theses server settings are rather unusual. Nevertheless we wanted to keep the risk for our users as little as possible, therefore reacted fast and closed the security issue with this release. We especially paid attention to the backwards compatibility with older versions. Backups you create now will be backed up in the same directory as before but now have a more complex name so they have no more similarity to the backup directories names’. Many thanks to Larry W. Cashdollar and the WordPress Plugin Directory who informed us! And our hint to all users: Update your version! You found a bug in BackWPup? Then please tell us over at Github so that we can solve the problem. If you need support for the free plugin, please open a ticket in the support forum of WordPress. We give our best to answer all questions fast and quick. However it is possible that you have to be patient. You’re a pro user? Please contact us via backwpup.com. As a pro user, you get our premium support. We assure you that solving your issue is extremely important for us. Thanks a lot for trusting BackWPup. Do you have any ideas how we can further improve our plugin? We’re happy about your suggestions! Or become a Beta-Tester and find ways to improve new versions before they are published.